Bobby Moore was England’s iconic captain during the 1966 World Cup Final, leading the English team to victory in the final against Germany. It is currently England’s only World Cup win and remains the most famous English sporting achievement of the 20th Century. Bobby Moore was also widely admired for his gentlemanly conduct both on and off the field. Over his international career, he was awarded 108 caps for England – then a record for an outfield player. His record has subsequently been beaten by David Beckham, though in an era pre-dating substitution, Moore played for the entirety of the game, unlike modern caps. He also played for West Ham for over 15 years before finishing his career with second division Fulham. He was widely regarded as a great gentleman of the game. 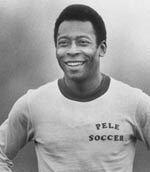 Pele said he was one of the fairest defenders he had played against. In the 1970 World Cup, many see Bobby Moore’s perfect tackle of Jairzinho as one of the greatest tackles of all time (in one of the classic world cup games.) As a defender and player, Bobby Moore was widely regarded as a commanding, authoritative presence. But, his imperious authority was always based on honesty, and fair-minded play. In an age of highly paid football stars and the immense influence of money in the game, Moore represents, to many, the Corinthian Spirit of honest endeavour. Bobby Moore was born in Barking, Essex on the 12th April 1941. As a youngster, he played for cricket for Essex youth team, but his greatest love was for football. In 1956 he made his youth debut for West Ham United, and in 1958, made his first appearance for the senior club. He went onto play 544 games for West Ham in the next 16 years. He moved to Fulham for the 1974-77 years before finishing his playing career abroad, including the US soccer league. In the early 1980s, he made a largely unsuccessful move into football management for Oxford City and Southend United. He also struggled with various failed business opportunities, being badly advised on financial matters. However, he was still very highly regarded in the game. He died in 1993, aged just 51, from bowel cancer. He was widely mourned and the Bobby Moore foundation was set up to raise funds for bowel cancer. He is regarded as one of the greatest England players of all time. Bobby Moore was awarded the BBC sports personality of the year award in 1966, the first footballer to achieve the award. Citation: Pettinger, Tejvan. 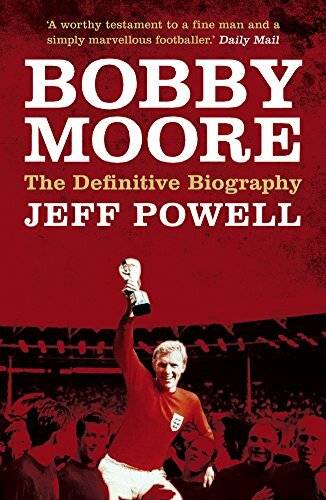 “Biography of Bobby Moore”, Oxford, UK. www.biographyonline.net, 28th May 2007. Updated 1st February 2017.